120G/m2 100% Polyester Neon Color Mesh Fabric and 1" Width Bright Yellow reflective strips. 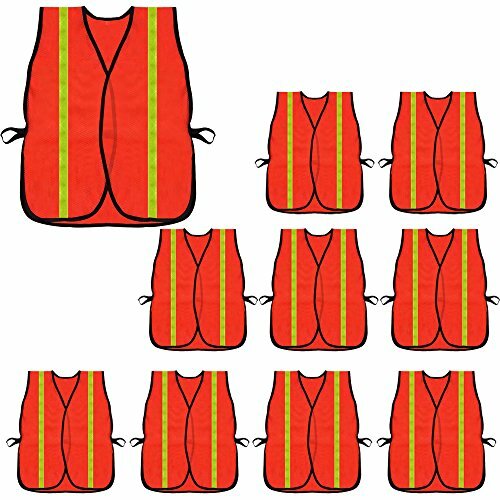 HIGH VISIBILITY AND REFLECTIVITY: Made From Ultra Lightweight and Comfortable Mesh Fabric And 2" Width Reflective Strips on Both Front and Back, Our Safety Vests makes you Visible in traffic from 1000 feets by day and night. Multi APPLICATION: Wholesale For Traffic Workers, Construction workers, Railway and Metro workers, shipyards, surveyors , Utility Workers like Security, Roadside Emergency,Clean Streets workers etc. Adjustable Size Fits almost adult men and women,ladies,youths,Easy On And Off.